Anyone know what kind of rodent this is? My cat apparently was quite busy yesterday and this morning I found two dispatched rodents outside. I thought they were your average mice until I looked more closely. I tried to figure this out myself, but I’m stumped so far, but very curious. The fur was greyish, like an average mouse. However, when you look at the creatures, they look a lot like hamsters. Short tail, maybe an inch and a half long (less than half the body length), and mostly hairless. 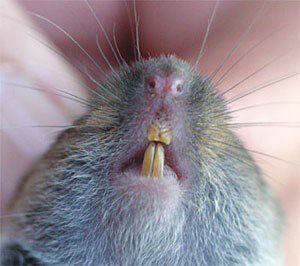 Small, furry ears like mice, and very long incisors – the odd thing is they appeared to be on the lower mandible, and I’m accustomed to seeing rodents with long upper incisors and shorter lower ones, these rodents seemed to have the reverse. Then, they have these long front claws that remind me of a mole, so obviously these guys dig. I live in the East Bay, California, in a somewhat rural area (lots of hills and cow pasture and such). Whatever it is have lucillelucillelucille around to shot em up. I’m with @dpworkin with the vole theory. They look like little torpedo-shaped mice. Don’t voles have a hairy tail? I’m easy. Milo brought me over 50 dead small rodents last summer. Snap away and also measure the length, unstretched. And speaking of incisors, here’s a cutie who needs braces. Short nose makes me lean towards the vole. Just without a hairy tail. Maybe he’s a teenager. @dpworkin: Ornithologists used to shoot birds and then measure their length without tugging on head and tailfeathers at the same time. Go outside and enjoy the day. I’m in too much pain to go out. That’s why I am here jerking your chain. @dpworkin :What gives, or is not giving? Okay, dead rodents for your perusal. I couldn’t get to my measuring tape because the garage is blocked, so I used a dolla. Have to run to do family stuff, sorry, but will be back later. :) Thanks, guys! Did it have on a little red shirt with an “A” on it? Please tell me it didn’t. Can’t see the pic. It is marked private. NO luck with pix. If it’s smaller than a dollar bill, it’s probably a vole. Whoops! I hardly ever use Photobucket and was totally unaware of any privacy settings.. sorry about that. This link should hopefully work now. Hmm. It looks like a dead dust bunny to me (they are related to voles.) The size eliminates all the chinchillas, beavers, and moles to me. @gailcalled Could it be a moose? I did not know chupacabras could be so small. Good to know! @Val123: Having lived in rural America for 26 years, nothing relating to animals would surprise me. So it’s a vole, right? I guess so? Though I am still kind of enjoying the thought of it being a weird hamster-mole. @MissAnthrope: Or possibly a mampster or a hole? Hahahaha! I love it. It’s officially a mampster. I want to say that I now completely understand what the heck she’s been doing, sitting in the grass for hours on end. She’s been completely mesmerized by something, though I just assumed it was something along the lines of bugs, lizards, snakes.. never occurred to me there might be mampsters! I bet’cha a million dollars they are baby Gophers. Do they have visible cheek pouches? I have tons of them in my yard and my cat brings them in quite often. It’s the right time for the first of the babies to start coming above ground, youngsters are caught easily when they are still small. Big overlapping incisors and digging claws…yep, Gophers for sure. Voles have short tails but not the type of incisors or claws you are describing. The adults can get pretty good sized, much bigger than a hamster. Oh….just looked at your photo’s…yep…thats a young Gopher for sure! Okay, so after pondering the sad state of the “lawn”, I started looking at photos of gophers and I found it! They’re Pocket Gophers. Just had to bury another one yesterday. Thanks for your help and amusing discussion.. I think I will keep calling them “mampsters” even now that I know what they really are. Is it weird I find them cute in an ugly kind of way? @MissAnthrope: Re; mampsters; remember where to send the royalties. Now, which rodent leaves a labyrinth of underground tunnels whose pattern shows on the grass like a collection of blood vessels on the wrist? I LOVE Gophers..they are adorable. I have about a half acre of lawn…they do their thing and I just keep adding more grass seed. Live & let live. Once I saw one take down an entire Artichoke plant that was about 5 feet tall. @Coloma – I was wondering about the grass seed thing today, I had an urge to get some to mix in with the turned-up dirt everywhere but didn’t know if that would work. Don’t the gophers eat the seeds? No, they only eat plant roots and grasses. They will just either move the dirt around some more, or, abandon that tunnel and then when the grass fills in come back and dig it all up again. But some seed will take. I finally figgered it out. It’s a baby kangaroo. right? Who's the realest in the show Bad Girls Club? What's your position on wolves in Yellowstone? How do you think you would react to an encounter with another intelligent primate?